both finals happening this week! My friend David measured the Hz of my crystal singing bowls for a project we are working on. 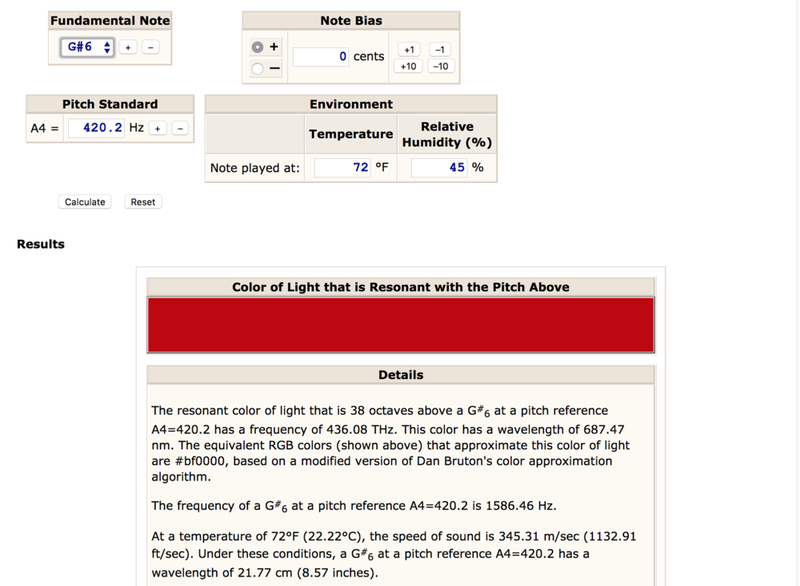 So now I have a way to translate them into color, even if it is not through Max but through this website which takes the Hz of the sounds and matches them to the Thz color/frequency in light... I plan to make a chord of a few bowls at once that I would play along to, maybe in in two parts. 5 minutes isn't as long as this piece would be, I think it would be something more like 15 minutes to 20 max...but it will be a study in this idea! It also seems that the relationship is not totally direct; it is somehow translating the frequency of both sound and light into the same thing, though the waves are quite different. However it is some way to make a scientific relationship and I think will be interesting to work with. The code above converts the frequency of sound to a frequency of light by doubling the sound frenency (going up one octave each time) until it reaches a frequency in the range of 400–800 THz (400,000,000,000,000 – 800,000,000,000,000 Hz). The speed of light that is used is the observed speed of light in a vacuum (299,792,458 m/sec). I believe that this is a reasonable approach, even though we are not playing these sounds in a vacuum. 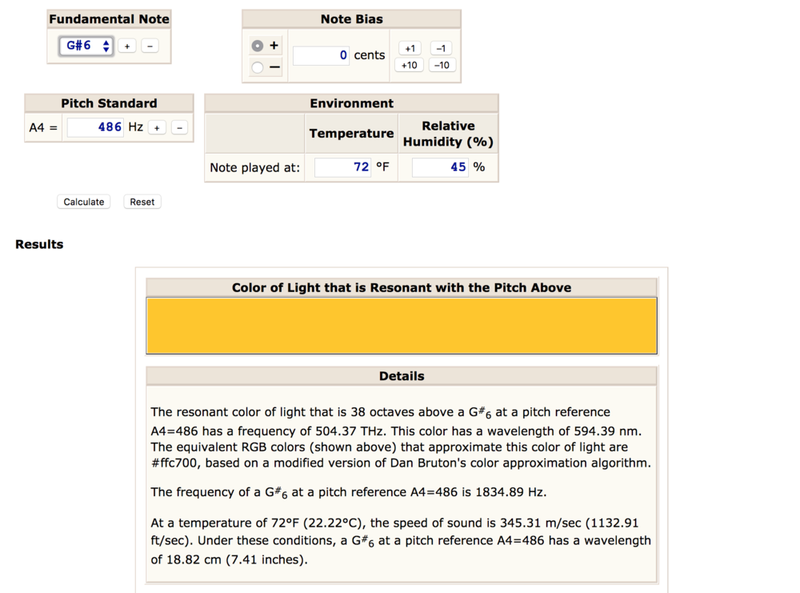 The code for rendering colors (see below) is based on this same constant for speed of light; When looking at resonance, I believe that it is really the frequency of the sound and light that we want to match, not the wavelength. OBJECT THEATER: FINAL PERFORMANCE FOOTAGE! I actually ended up going to several audio-visual concerts this semester, so I chose to use one set from each concert I that attended to talk about for this review. I'll start this one off by saying that is is one of THE most epic audio-visual performances I had ever seen IN MY LIFE, and I almost didn't go to it due to a scheduling confusion, and I'm glad our class urged us all to attend one of the three nights hosted by Clocktower and Undervolt & Co at the AMC movie theater. I'm sure all the nights were great, but I only made it to the one headlined by the Sun Ra Arkestra with YATTA opening, which was also wonderful, but for this I will focus on the Arkestra's performance and accompanying visuals by Sabrina Ratté and Peter Burr. While the 15+ person Arkestra would also have been "enough" on its own any day to energize a whole movie theater worth of people, I feel that the live visuals behind them did serve to beautifully support their horns' shrieks and wails and cosmic vocal utterings, like lightning supporting a thunderstorm (or something like this...what are other natural phenomenons of audio and sound that this could be compared to? The sun glistening on a roaring waterfall?). I thought Sabrina Ratté and Peter Burr did a great job of using what I am assuming was raw visual synthesis and a lot of knob turning on a modular video synth like the LZX synthesizer, following along with the movements of the Arkestra's admittedly very extended set artfully, punctuating it or mirroring it with colors and patterns that seemed to ping and reverberate off and with the music. This pairing of sound and visuals kept the energy up, up, up just like the Arkestra's music did, almost dipping in just a few moments but then rising to the top and staying there or going even higher than before, until it reached a point of feeling effortless, with an extremely positive and high vibration ultimately achieved by the end of the night. I appreciated that the images were abstract, all colors and lines and shapes made of different combinations of the two, and I think that worked very well to not distract from the music or act as a counterpoint but instead acted as an extension of their bejeweled and sparkling costumes and energy of their sounds, making the wallpaper or theater's screen come alive with lights that seemed to almost emanate from the sounds themselves. It also made me think how effective it is to have the visuals really BIG. I'm really so glad I went! This is a show that I also played at, hosted by Pas Musique, who also run the label and platform Alraeleon Musique. The venue Spectrum used to be housed in an apartment on the Lower East Side and it has since moved to a new location on Flushing Ave near the Navy Yard in Brooklyn. Pas Musique has been working with the owner of The Spectrum in both locations to host this series called Ambient Chaos, where ambient music (sometimes very quiet and meditative, sometimes noisier or even jazzier or more improv-based, so really covering the "ambient" spectrum) is paired with live visuals by different resident artists. For this night it was a pleasure to work with Jim Tuite, who I have seen do visuals numerous times, and see his how his process worked over the course of 4 sets. I talked to Jim some afterwards, and he said that he really tried to listen to each musician and come up with a palette that was suited specifically to their music, which I see again as a beautiful way to support the music and act as an extension of it. Often in these music venue environments I have found that visuals are seen as secondary or unnecessary, but even if things CAN happen without them, in this night at least I really felt that the pairing is what made it special, and though Jim was responding to the music and not the other way around or in between, it still felt like an equal footing. I enjoyed how he did change it up for each performance, using VDMX to trigger clips and add audio-reactive (I think?) elements that mirrored the music in subtle ways, playing with space and fields of vision, where the foreground would continuously melt away revealing some figures beneath or something almost recognizable, only to then go somewhere totally different and wash the brain with abstract color fields and shapes, to then return to something almost recognizable like people walking around on the street...Genevieve (Lauds)' music was also a beautiful layering of tones and textures both smooth and rough that seemed to fit perfectly with the visuals Jim chose for it, and it felt particularly meditative to sink into the visuals during her set. This night is another example (like the Clocktower/Undervolt & Co. series at the AMC theater) that I probably wouldn't have known about or gone to for sure if it were not for our class and encouragement from fellow ITP classmates to check it out. Again, I'm really so glad I went. 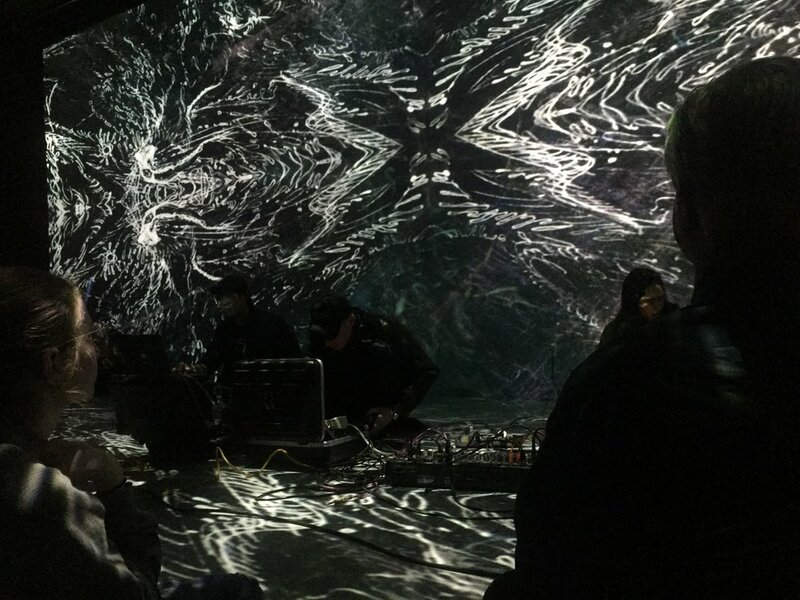 I chose to focus on the second set of the night, because it seemed very mysterious to me and I had not heard of any of the artists, and it seemed to be one of the most non hierarchical arrangements of an audio/visual performance that I have seen. I think this was in large part due to the installation of the space, an immaculate 3 surface projection studio where the audience member's were asked to wear cloth booties so as not to scuff the projection surface on the floor, which made it obvious that they had considered the projections to be an essential part of the experience. It felt like a new kind of venue or experience, and a treat. Because of this the visuals felt so "immersive" (big buzz word there!) in conjunction with the sound (which also had a great system setup it seems), and one did not feel more in the forefront than the other, as I usually feel in music venues that the music is the obvious first priority, with visuals as an afterthought. It felt that this set was a *true* audio-visual performance where both were totally intertwined. I'm not sure if there was any direct interaction like audio reactivity happening with the visuals, but it felt that there was. The three participants sat on the floor, and it was hard to tell who was doing what, though two had laptops and one had a modular synthesizer setup. The sounds were electronic washes and bubblings that created a ambient soundscape that was almost tactile, washing around us, with at times an acoustic instrument introduced on top, such as a flute or harmonica, which brought it to this almost ceremonial place with the DMT-esque visuals. While I say the visuals looekd DMT-esque they however managed to stay clear of full-on cheesy psychedelia, instead creating an elegant place that also seemed to be tracing the very fabric of the universe, drawing on psychedelic experiences or tropes that we see in pop culture, but again without going too far. Some of this kind of imagery might also just be what visual engines are capable of in terms of basic visual synthesis, hence we see them a lot (such as mirroring, for example) but done in different ways and with a different touch. In this case I think the video artist had a very nuanced touch and also used a lot of variation to create a feeling of a "journey" which was very special and unlike anything I had seen exactly. Because the projects were covering two walls as well as the floor, it also really felt that we were IN the projections, and that added so much as well. I would love to see more venues like this starting to pop up in cities or places everywhere. The above video is a demo of what I did for our "3 minute video performance" assignment in class on Monday, but a little shorter and more condensed than when I did it live, where I think the transitions lingered for longer in between clips. Each time I go through the sequence in Max it ends up being/looking/feeling a little different. Through practicing live mixing this sequence I got some ideas for other videos like this that could be mixed with Jitter in realtime using tones and color, in different patterns or lengths, and be shown as standalone videos afterwards or in an installation, or possibly used also as part of a longer live performance. Using Max does change how the video ends up looking or feels to control, and because of the nature of how I'm moving the parameters with a track pad in the presentation mode's interface (which I did enjoy having the ability to modify!). Maybe a MIDI controller would yield a different result when mapped to the presentation mode, or TouchOSC, which I didn't get to using this time. I actually wonder how smoothly that would work. It would be ideal to have a big clunky video mixer with giant dials for changing the effects that transitions very slowly or quickly as needed. Ultimately I think this general idea will eventually take a longer form, and also be developed for my final for this class (possibly also incorporating the crystal singing bowls/lights as we discussed before!!). Note to self: Again in relation to things we are learning about in Algorithmic Composition — I also was thinking of shifting a series of video clips like these algorithmically or randomly somehow so the sequence would never be the same, like a self creating meditation video that plays on endless changing loop, with audio as well either attached to the clips or shuffling. In the future I would like to build on this. Another note, many days later: Go MORE abstract moving forward with this! And spend longer on each clip in the longer version to sprawl it out. The eye was too literal and did not get sublimated enough here. More blurry, smoothening, barely decipherable shapes/images and slower. I am thinking now that I will just play with the video clips' audio and do a collage with the videos I made for week one, incorporating both audio and video together to sequence through ~7 stages in a sort of humorous chakra journey (which is also something I am working with in general as a concept--if not the traditional chakras then some kind of sequence like that with different sounds and colors). It will be incorporating people making tactile (non-computer) art and the music they were listening to, and what they were talking about, sometimes chopped and screwed. I may or may not also sync it with 3 minutes of a backing track that helps to sonically demarcate where the changes happen. I also experimented with adding the jit.op math operations to blend layers which does similar things to the blending layers function in Photoshop, but decided that I will not use them at least now, though am glad to know that option exists! Realizing more deeply that everything behind art and music (at least that is made on the computer or with electronics) is directly related to math. Also I guess everything in the universe probably. Wish I was better at math but am also just glad to see the underbelly of this whole world and know what it is made of a little more intimately! My abandoned 4 channel mixer..
Next I will narrow down and edit the video clips I want to use, and experiment with adding audio/music of my own, then try to go through a demo sequence and record it. My current set up - back to the 2 channel video mixer with some modifications.